I absolutely love this series. Cruising on a luxury yacht with Helen may just be the perfect escape if it wasn’t for all the washing and ironing and cleaning toilets. 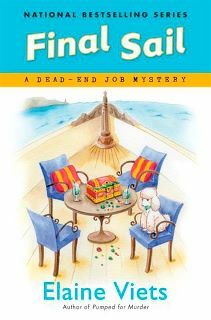 What started out sounding fun was real work and then to track down a smuggler in her spare time made for a wild boat ride. Phil with his hats and wigs posing as everything from Rastafarian to an air conditioning repairman to follow around the new Mrs. Zerling was a hoot and Helen got back from her voyage just in time to put herself back in the middle of the fun. 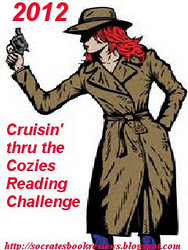 Elaine Viets never disappoints, she delivers mysteries that are fast paced and always entertaining! Helen and Phil make a heck of a team. Each edition tops the last and there is always that little trickle keeping us tied to Helen’s past which always leaves the reader wanting more. I can’t wait for my next adventure with the gang from The Coronado Tropics Apartments! Sounds interesting! I’ve never heard of this series before. I’ll have to check it out! Forgot to add that I love your new look!